Nuena Vista City Hall is located at 2039 Sycamore Avenue, Buena Vista, VA 24416; phone: 540-261-6121. Photo: W.N. Seay House, ca. 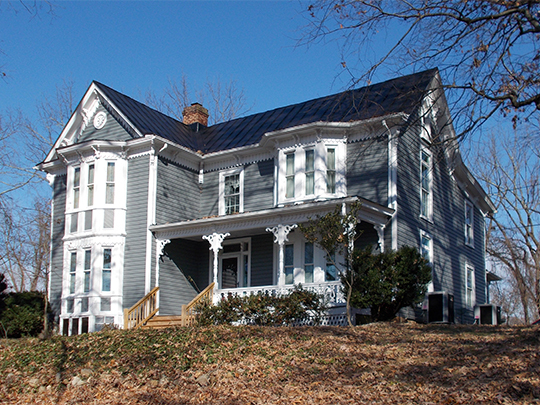 1889, 245 West 26th Street, Buena Vista, VA. Listed on the National Register of Historic Places in 2007. Photographed by User:	Pubdog (own work), 2012, [cc-by-1.0 (creativecommons.org/publicdomain/zero/1.0/deed.en)], via Wikimedia Commons, accessed January, 2014. Buena Vista was a product of the rapid economic and urban development that swept western Virginia in the 1880s and which spurred the creation of new cities and the growth of existing communities. Virginia's "boom," as the development was known at the time, was spurred by the construction of rail lines into the Southwest Virginia/West Virginia coal fields and other resource-rich areas. The railroad expansion attracted Northern capital, and it led to the phenomenal growth of Roanoke, known as the Magic City, and points as far east as Norfolk, the state's main coal port. The Richmond Dispatch noted in 1891: "Virginia has had a 'boom.' New towns have sprung up in fields and forests. Old ones have grown greatly. Where we used to have few cities we now have many. It is an era of development of our iron and coal lands; of the planting of new industries, and the determination to make Virginia a manufacturing state." The development came late to Rockbridge County, in the waning years of the 1880s, but it sparked no less than four local booms in the pre-existing community of Lexington and the new communities of Glasgow, Goshen, and Buena Vista. Buena Vista adopted its name from the antebellum Buena Vista Furnace, which stood nearby. Although true urbanization did not commence until 1889-90, development within the future city limits began in the early 1880s when the Shenandoah Valley Railroad (later absorbed by Norfolk and Western) and the Richmond and Alleghany line established a junction beside the Maury River. This led to the establishment of the village of Green Forest near the confluence of the river and Chalk Mine Run in the northern part of the present city. Businessman Benjamin C. Moomaw, the chief developer of Green Forest and a force in the creation of Buena Vista, penned a first-hand newspaper account of the events in 1909. "The next step [after the creation of the rail junction] was to lay out the town of 'Green Forest,'" Moomaw recalled, "which occupied the territory now covered by Beech Avenue, Factory Street, Canal Street, Brook Street, Alleghany Avenue and Twenty-ninth Street. Perhaps few of your readers know that a flourishing village preceded Buena Vista by several years, and that it was the rapid growth of this village which suggested to the writer the possibility of a much larger development. In addition to the tannery I had secured a canning factory, planing mill, pulp mill, and was reaching out after some other industries, but it soon became clear that unless large capital and good executive ability could be enlisted in the enterprise I would at best only have a village, with a few industries and a store or two." Moomaw was no doubt inspired in his enterprise by his older brother John C. Moomaw, who as a road agent for the Shenandoah Valley Railroad was instrumental in routing the line through Bick Lick and initiating the development of Roanoke in 1881. Over the Christmas holiday in 1888, Moomaw drafted a "prospectus for the city of Buena Vista." He enlisted Lexington/Rockbridge County business leaders C. F. Jordan and A. T. Barclay to help build momentum for the plan. The Buena Vista Company was formed, followed by "two years of intense activity, laying out the town and getting in the industries," Moomaw recalled. The Buena Vista Company hired W. J. Hurlbut, W. M. Dunlop, and a Mr. Wingate to lay out the town. Hurlbut, the principal town designer and soon Buena Vista's city engineer, was an Illinois native who worked on railroad and land surveys in the West before moving to Virginia, where he subsequently served as Rockbridge County Surveyor in the mid-1880s. The town survey began on February 26, 1889, and produced a conventional grid plan extending to the south of the preexisting village of Green Valley on level ground known as Harts Bottom. The west flanks of the Blue Ridge Mountains rose precipitously from the city site, prompting a commentator to exclaim "It will be hard to find anywhere a fairer or more attractive site for building than this picturesque city, surrounded as it is, by scenery unsurpassed even in Switzerland." To aid eager purchasers who might have wished to view lots in the dead of night, the development company is said to have "strung up thousands of light bulbs over fields plotted out as neighborhoods ... It was the only place in Virginia, one visitor recalled, 'where you could hunt bull frogs by electric light.'" The town plan defined multiple narrow lots along Magnolia and Sycamore avenues, a feature that implies dense commercial development was anticipated in those areas, and which presumably offered lot purchasers greater flexibility in how they developed their lots, since combining small lots to create larger building sites would have been easier that subdividing large lots to create smaller building sites. An early map labels the blocks between Sycamore Avenue and the railroad "reserved for industrial and manufacturing purposes," although by early 1890 commercial development was permitted in the area, at least along the 200 block of West 21st Street in the historic district. The Hotel Buena Vista—grand hotels were a key aspect of the booms—opened July 1, 1889, on an elevated site overlooking the still mostly vacant town. (In later years the hotel housed Southern Seminary, followed by Southern Virginia College, and it currently serves as the main building on the campus of Southern Virginia University.) In October 1889 the Buena Vista Company announced it would erect its office building at 2110 Magnolia Avenue. Along with the establishment of the Union Depot of the Shenandoah Valley and Richmond and Alleghany railroads two blocks to the east, the construction of the company's offices helped ensure that the connecting thoroughfare of 21st Street and adjacent blocks would become the commercial heart of the new city. J. Daniel Pezzoni, Landmark Preservation Associates, Buena Vista Downtown Historic District, Buena Vista, VA, nomination document, 2009, National Park Service, National Register of Historic Places, Washington, D.C.